Who the Hell Were Mike Landers and Bobby Sty? The tunes I bring to you today are very likely not performed by the people credited with performing them, mosty because those people probably didn’t exist. 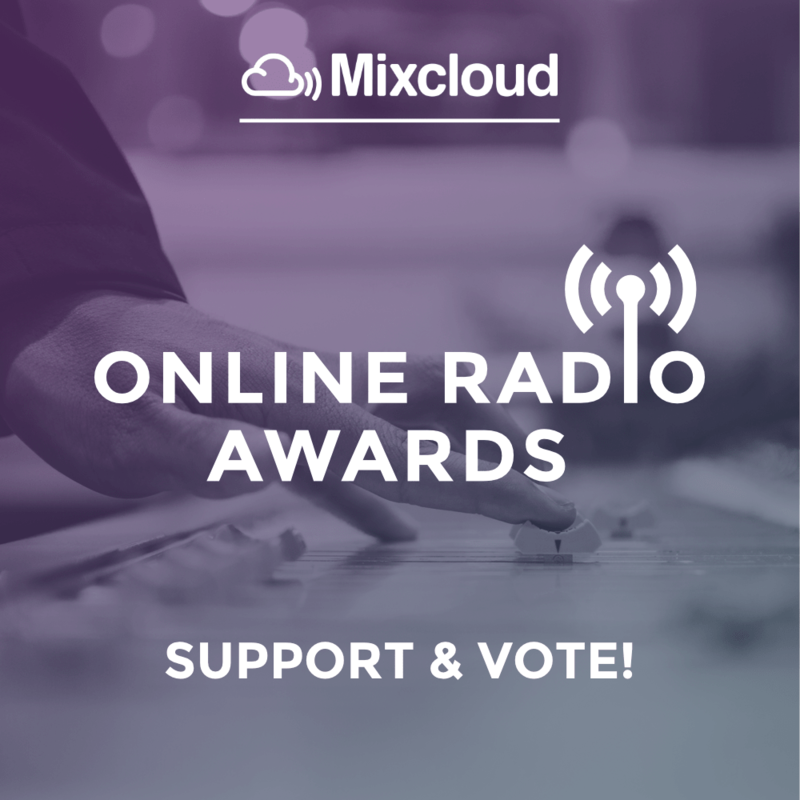 The tracks I bring you today, versions of the Who’s ‘I Can See For Miles’ and Billy Joe Royal’s ‘Hush’ (written by Joe South, natch, but a copy of BJR’s arrangement), credited to “Mike Landers”, and a cover of the Strawberry Alarm Clock’s ‘Incense and Peppermints’ by “Bobby Sty” come to you from an exploit/budget album, so obscure, so ultimately disposable, that it doesn’t even turn up in Google or any of the major record databases. I’m a sucker for albums like this, and though most of them are utter crap, lazily recorded/produced cash-ins meant to fool unsuspecting consumers back in the day, every once in a while you stumble upon something pretty cool. What little I have been able to find out about these recordings exists only in the periphery, and steeped in circumstantial evidence. 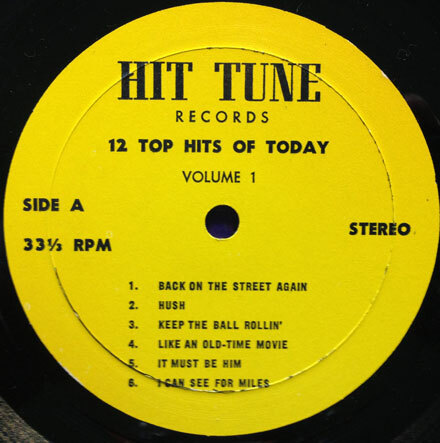 Taking the material covered on the record ’12 Top Hits of Today’ (where the artists are listed on the back but not on the label), and the fact that some of the tracks were released in other countries on 45, my best guess is that this record came out in 1967. The circumstantial evidence I mentioned earlier seems to tie these recordings to the exploitation factory of Ed Chalpin, who worked out of New York City and is also tied to the long string of recycled Curtis Knight/Jimi Hendrix bootlegs that have come out over the years. 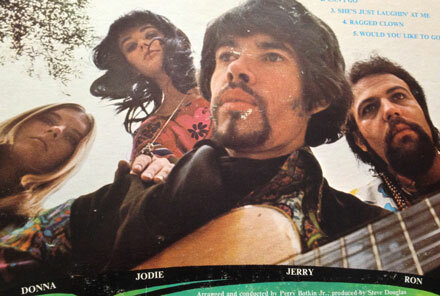 That said, I would guess that ‘Mike Landers’ and ‘Bobby Sty’ are pseudonyms for whatever gang of longhairs that Chalpin gathered in the studio to churn out covers of other people’s hits. The version of ‘I Can See For Miles’ is actually pretty cool in a garage 45 kind of way, as is the cover of ‘Hush’ (though in a more subdued way). 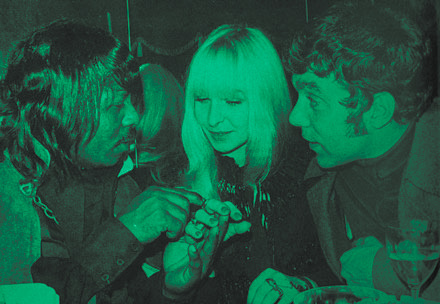 Both of these tracks were released on 45 in South America under the ‘Mike Landers’ name. The version of ‘Incense and Peppermints’, credited to ‘Bobby Sty’ is a tiny bit more inept, but also interesting in a way that would have landed it on a comp. That track, and another one of the covers from the same album (a version of the Sunshine Company’s ‘Back On the Street Again’ by ‘The Pendants’ found their way onto a 45 in Africa. That 45 bears the PPX Productions credit that ties the whole mess back into Ed Chalpin. There were a lot of labels cranking out stuff like this in the 50s and 60s, often for the jukebox market (thus a grip of 45s on labels like Tops, Curio, Peak, Power, Diplomat, Guest Star , Spin-O-Rama etc), and the phenomenon continues today in iTunes with tons of soundalike versions (sometimes modern re-recordings by current versions of old groups) of songs showing up in their catalog. Certainly the story/scene in the background is more interesting than the music, but sometimes it just bes that way. At first glance, the album that yielded today’s selections might seem to be yet another in a long line of exploitative attempts to co-opt the youth market with a dash of exotica from the Raj. A look at the career of the album’s creator, Alan Lorber, who had along history writing/producing/arranging mainstream pop would likely reinforce that belief. Yet when you allow the stylus to wind its way through the grooves on the record, what is revealed is not a cash-in, or a lazy appeal to hipsters, but something of unusual and rare beauty, hiding under an unusual veneer. Lorber was a NY based composer/arranger who worked in the 50s/60s and 70s on the kind of mainstream pop and R&B sessions that would suggest a detached, professional journeyman, doing whatever work came down the pike. 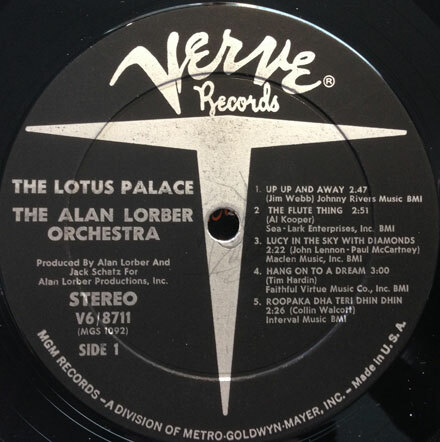 Yet sometime in the mid-60s, Lorber started to get his hands on deeper, more interesting things, working with more progressive artists, and, most interestingly on the record you see before you, ‘The Lotus Palace’ by the Alan Lorber Orchestra. 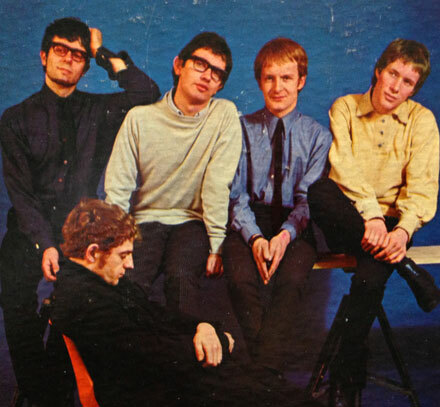 Recorded in 1967, the album covers a lot of contemporary material (Beatles, Sergio Mended, Tim Hardin and the Blues Project) as well as offering a couple of originals. The group put together for the session suggests not only the East/West fusion suggested by the cover, but an exploitative/serious fusion as well. The name Vinnie Bell, inventor and primary proponent of the electric sitar is there, but it sits alongside that of world music/new age pioneer Collin Walcott who contributes acoustic sitar and tabla as well as famed sessioners Hugh McCracken and Jerome Richardson (who also recorded for Verve), which taken as a whole suggest something else entirely. Once you listen to the album, it is immediately apparent that this wasn’t some throwaway, but rather a serious, well executed bit of musical fusion, that ought to be better known than it is. The two tracks I bring you today are covers of the Blues Project’s ‘Flute Thing’ and the Jimmy Webb-penned 5th Dimension hit ‘Up Up and Away’. ‘Flute Thing’ was already a slightly trippy affair, but the ALO takes it into uncharted waters, adding tabla, gamelan and sitar. The new version has a deeper, stranger feel to it, and the counterpoint of the gamelan and the double-tracked flutes gives it a very far-out feel. 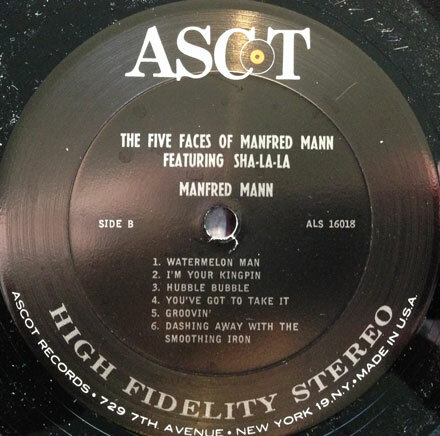 It’s interesting to contrast the ALO version of ‘Up Up and Away’ with the much better known (at least among Now Sound types) take by Rajput and the Sipoy Mutiny, which has a following thanks to being reissued and played frequently on the Howard Stern Show. The Rajput version – released on an even more budget-y wing of Pickwick (if that’s possible) called Design – is cheesy, bordering on inept and has a certain amount of comic value. The version by the ALO is a masterwork of subtlety in comparison. Better played, arranged and produced, delivering well above its pay-grade. Compared to the rest of the ‘Lotus Palace’ LP, it does sound kitschy (probably due to the familiarity of the song) yet even then, it’s a great listen. Lorber’s arrangements are thoughtful and progressive and the playing by all involved is top notch. 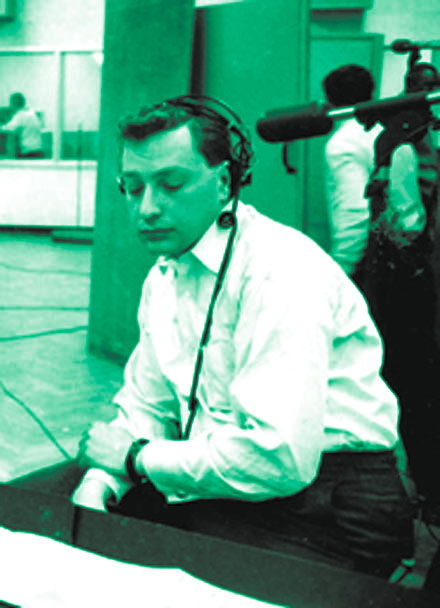 Lorber was also involved in MGM’s (unfairly) notorious Boston Sound in the late 60s, producing Ultimate Spinach, Puff, Orpheus and Chamaeleon Church. Despite the fact that he was a very busy man early on, Alan Lorber seems to have stopped working as a producer sometime in the early 80s, and there’s nothing out there to indicate what he’s been doing since then. His work on ‘The Lotus Palace’ makes me wish he’d done more in that vein. As far as I can tell though the album was reissued by Big Beat in the 90s, it is out of print today. 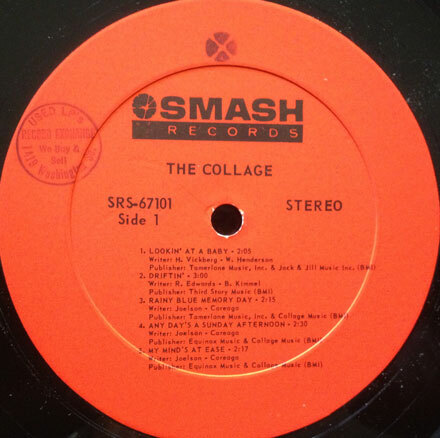 There were also a few 45s released at the time, but none of them contain non-LP material. Fortunately, original copies of the record aren’t usually too expensive.